CarGurus has 389 nationwide Mercedes-Benz GLC-Class dealers with 12,969 new car listings. The GLC-Class consists of small luxury SUVs with coupe variants and a couple high-performance AMG models. For 2019, the GLC-Class gets minor feature updates. In terms of looks, the GLC-Class is sporty yet premium with a traditional profile. 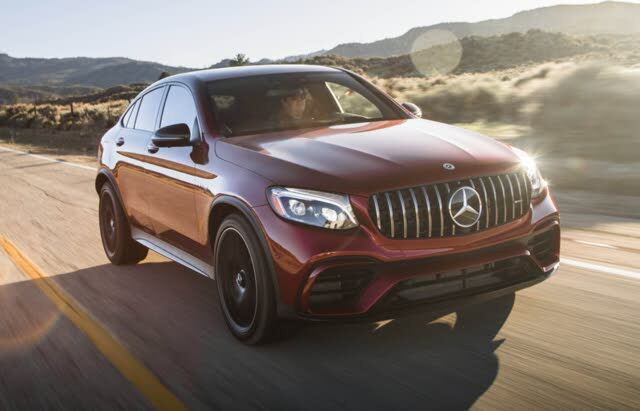 The GLC 300, which comes with rear-wheel drive (RWD) but can be upgraded to the 4MATIC all-wheel-drive (AWD) system, is powered by a 2.0-liter turbocharged 4-cylinder engine with 241 horsepower and 273 pound-feet of torque, paired to a 9-speed automatic transmission. You can expect fuel returns of 22, 27, and 24 combined for RWD and AWD. The GLC 350e is a plug-in hybrid that adds a 85kW electric motor to the turbo 4-cylinder mix, good for 320 hp and 384 lb-ft. The GL 350e is only available with AWD, so fuel economy sits at 25 combined for gas and 56 combined for gas and electric. The AMG models, which include AWD and the 9-speed automatic, round out the list. The AMG GLC 43 gets a 3.0-liter twin-turbo V6, good for 362 hp and 384 lb-ft. It delivers fuel economy of 19, 25, and 21. The AMG GLC 63 gets a 4.0-liter twin-turbo V8 with 469 hp and 479 lb-ft, returning 16, 22, and 18. This same engine is tuned for 503 hp and 516 lb-ft in the GLC 63 S and returns the same fuel economy. The GLC-Class cabin is plush and sophisticated, even in base form. The GLC comes with synthetic leather upholstery, heated front seats (standard for 2019), dual-zone automatic climate control, push-button start, heated windshield wipers, and a power liftgate. Options include leather upholstery, a panoramic sunroof, tri-zone automatic climate control, sport seats in AMG models, and interior trim upgrades. Inside, you’ll also find an infotainment system with a 7-inch screen, but you’ll have to upgrade to get the more desirable features. You can trade up to an 8.4-inch display, satellite radio, voice recognition, Apple CarPlay, Android Auto, navigation, and a premium Burmester audio system. The Insurance Institute for Highway Safety (IIHS) awarded Good scores and a Top Safety Pick+ rating to the 2018 GLC-Class, and the National Highway Traffic Safety Administration (NHTSA) awarded a 5-star overall rating. Standard safety features include a reversing camera, forward-collision warning, and automatic emergency braking. For options, there’s a surround-view camera, a head-up display (HUD), blind-spot monitoring, adaptive cruise control, active brake assist, active lane control, and automatic high beams. The GLC-Class might be on the small size, but the options menu is big, competing against the likes of BMW’s X series and other premium crossovers like the Alfa Romeo Stelvio. What's your take on the 2019 Mercedes-Benz GLC-Class? Have you driven a 2019 Mercedes-Benz GLC-Class? CarGurus has 17,258 nationwide GLC-Class listings starting at $20,982.